Preheat the oven to 350 degrees. 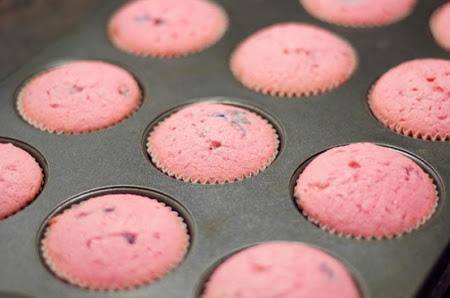 Line a muffin pan with paper liners and set aside. In a large bowl, or the bowl of a standing mixer, combine the flour, sugar, baking powder, and salt. Add the butter, sour cream, egg, yolks, and vanilla and beat until smooth. Scrape the bowl to make sure it's combined, then stir int he cotton candy until evenly distributed (do not over mix). Place two tablespoons of batter in each of the paper liners int he prepared muffin pan. Bake for 18 to 22 minutes, until a toothpick inserted in the center comes out clean. Transfer to a wire cooling rack and allow to cool completely before frosting.